All prices are for two/four people. Beautiful contemporary top floor apartment in a new prestigious development with large balcony offering stunning views over the City of Funchal, the harbour and the sea beyond. 10/15 minutes downhill walk to the City Centre. This comfortable,well furnished apartment sleeps up to four people (main bedroom with large double bed and en-suite bath/shower room, wall mounted TV; second bedroom with twin beds and adjoining family shower room). Both rooms are light and airy and have good wardrobe and storage space. The spacious sitting room has a large 'L' shape sofa, perfect for relaxing, glass topped dining table and 4 chairs and is equipped with cable TV/DVD/Radio/CD. The glazed patio doors have access to the spacious terrace/balcony with outside dining table/chairs. The fit ted modern kitchen is well equipped with large fridge/freezer, electric hob/ oven, microwave, dishwasher, washer/ dryer. There is a delightful swimming pool for you to enjoy and also secure garage parking. The flooring is a mixture of good quality marble floor tiles and in the bedrooms you have solid wood. Own dedicated car parking space in the secure garage under the apartment block. We can arrange for taxi transfers from the airport - these cost around €30 each way. Manuel, our very helpful taxi driver, can also take you on full day or half day tours. These cost around €75 for a half day and €115 for a full day and these tours are highly recommended. 10/15 minute walk downhill to town centre with an excellent one way bus service from the centre of the city up to apartment(with a convenient bus stop right outside) but this service does not operate on Sundays. Car Hire can be arranged at a cost of around €45 to €50 per day or there is, of course, an appropriate weekly rate as well. WIFI Broadband is available at a cost of £13 or €15 per week. Special rates available for 3 weeks or more. Mobile/Portable small air conditioning unit. Heating is by portable electric heaters. Luxury Gym adjacent to the Swimming Pool...costing €25 per week per person. This facility costs €15 or £13 per week with special rates for three weeks or more. Lovely spacious roof terrace with special views of the town and harbour and to the sea beyond. Palheiro Golf Course is quite close. The owners consider that, due to the very high quality of the decorations and furnishings in this brand new apartment, the apartment is only suitable for the most discerning of clients. Lift available from entrance and garage area to the apartment. Anyone with walking difficulties please note that there are slopes and steps around the building and swimming pool area. 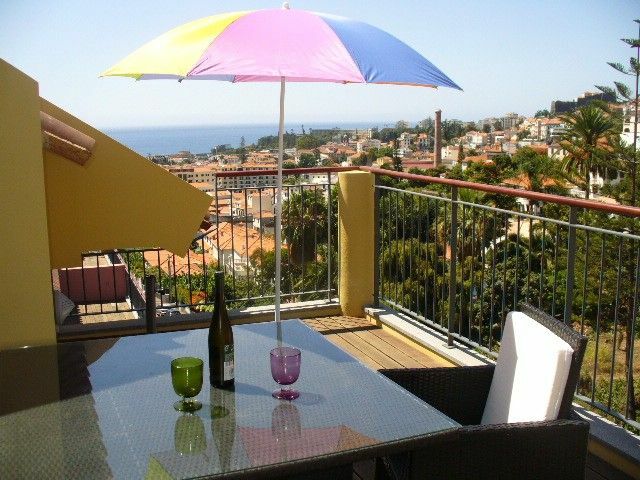 Beautiful modern apartment with stunning views over Funchal from the roof terrace. Well equipped and comfortable. Emily (housekeeper) provided everything we needed and gave us a comprehensive handover, with lots of tips to help our holiday go smoothly. Our favourite place for lunch was the Forte Restaurant in the Old Town. We can thoroughly recommend Manuel for airport pick-up (arranged through the owner) and tours of the island. We had wonderful day tours of the West of the Island, and on our last day, the East, culminating in drop off at the airport. Fantastic end to the holiday! It is not as easy as I expected to get Homeaway to organise the return of £150 damage deposit. Please could you let me have your address so that I can post a cheque to you. Family of 4 getting some winter sun. The apartment is an easy walk down to the centre of Funchal. The apartment is well appointed, nicely decorated/furnished, clean and in good condition. Nice en-suite bathroom in the main bedroom. We had a very enjoyable stay. We didn't get much use out of the pool as the water was a bit nippy, understandable as its solar heated and the trip was in February. Still nice to sit around the pool. Didn't use the gym but it looked decent. Both the cleaner and taxi driver supplied were very helpful and courteous. The listing description is accurate and the owners kept up good communications throughout and were very generous with respect to us breaking a lamp taking only the bare minimum from our deposit and making effort on their part to make it as cheap as possible. Overall I would recommend this apartment. I would consider staying again should we be looking for an apartment in Funchal. We are a family of four with two mid-teenagers. The apartment is spacious, clean and well equipped with the highlight being a large south/west facing balcony which has beautiful views of the city - a great place to watch the sun go down. The pool area was good and quiet while we were there. The owner, Emily the housekeeper and Manuel the taxi driver were all very helpful. The location in the older part of the city is good - the walk down to Funchal is pleasant but the walk back uphill is more challenging. However the taxi fare is reasonable - approximately 6 Euros and taxis are very easy to find. A return trip is a must. This is a brand new prestigious development with own landscaped swimming/spa pool with sun beds - 10/15 minute walk to the town centre(downhill). Residential area with sweeping views of the town, harbour and of the sea; also views of the mountains including the area of Monte. Own dedicated secure car space in underbuilding garage. Bus service available from town centre with a convenient bus stop outside. Golf: There are three golf courses available: two on Madeira Island and one on the Island of Porto Santo. The closest one is the Palheiro golf course which is in a particularly attractive location. The second one, slightly further away, is at Santa de Serra. Special discounted rates apply at the Palheiro course.